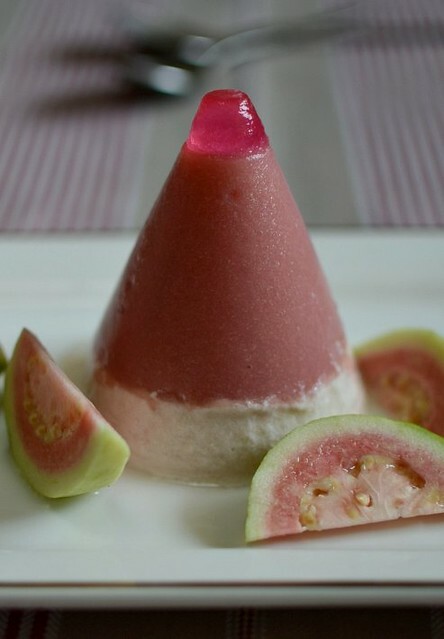 Delicious, flavorful and refreshing sherbet and sorbet made with home-grown guava. Look at that beautiful color! This one's made without gelatine and whisking. I love tropical fruits for their interesting looks, flavor and texture. The pink guavas from a friend's tree were so intense with flavor, bite and color that I knew straightaway that I had to use them for Royal Selangor Pewter's jelly challenge. The weather's hot here and icy treats such as sherbets and ice creams are perfect for cooling. A sorbet is a frozen dessert made of fruit, sugar and water while a sherbet has in addition, milk and sometimes cream. Other than tasting delicious and refreshing, sherbets and sorbets are easy to make even without an ice cream maker but, like mine, they will not be as light and smooth. I used 100% fresh fruits, no artificial flavoring or coloring (except for the 'tips') and very little sugar and the sherbet sorbet (I know, sounds like Robert Robertson. Mary Mei Li) was delicious and refreshing, perfect for 35 C weather. Speaking of weather, my biggest challenge is not developing new recipes or having to blog daily. It's taking photos of jellies in hot weather. I've had jellies that won't drop out but then melted when the moulds were immersed briefly in hot water. Today I've had people who are here on holiday drop in when I was taking photos and they stayed and stayed and left when the sun was at its height and the heat the greatest. I've had a day last week when the tail of a storm in the Philippines (north of here) knocked out the electricity for 8 hours and the jellies just sagged within 10 minutes of shooting. Hot weather is the real challenge for me. Sweet and flavorful pink guavas from a friend's garden. Guavas are tropical fruits that originated from South America. Here in Malaysia, guavas are found growing by the roadside and in many gardens because they are hardy plants usually brought in by the birds. When I was a tree-climbing tomboy, I used to spend my afternoons on a guava tree, eating the fruits before the birds can get them. Guava trees don't grow very tall or big but my perch was high enough for me to watch out for my father and scramble down the tree as he drove in. If you haven't read a book (in those days, a Mills & boon love story book where the guy confesses to the girl only in the last 3 pages that he loves her and not that hot but catty woman he's always with) on a tree on a balmy afternoon on a tropical island, you truly have missed out. Anyway, guavas. The guavas I ate were the old-fashioned kind, small with lots of seeds but packed with flavor. Those guava trees have become rare but can still be found in the villages and countryside. The guavas we get now are hybrids from Thailand where agricultural research has turned the fruits into big (apple-sized), crunchy and fleshy fruits with less flavor but that's because most guavas, like other commercial fruits, are picked too early. 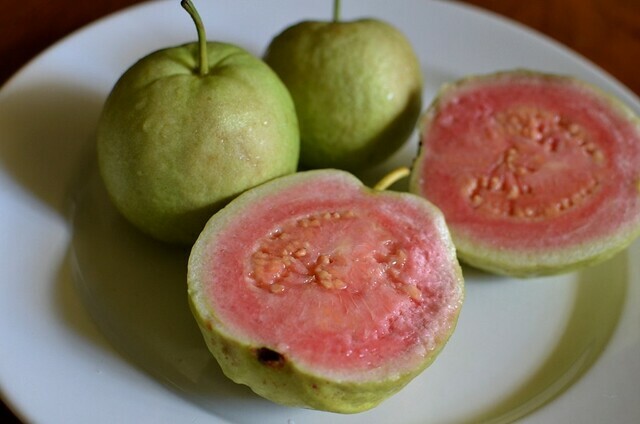 Eat a guava fresh off a tree and you'll marvel at the sweetness and flavor. I have a white-fleshed guava tree but don't get many good guavas from it because it is susceptible to bugs. Pink guavas are lovely and highly flavored but have too many seeds although that's how all guavas were before the scientists worked on them. Guavas are one of those 'superfruits' which pack lots of vitamins, minerals and antioxidants. One guava has nearly 5 times the amount of vitamin C in one orange: 228 mg per 100 gm guava versus 45 mg per 100 gm of orange. If you are counting calories, reach out for a guava (112 kJ) rather than an orange (192kJ). 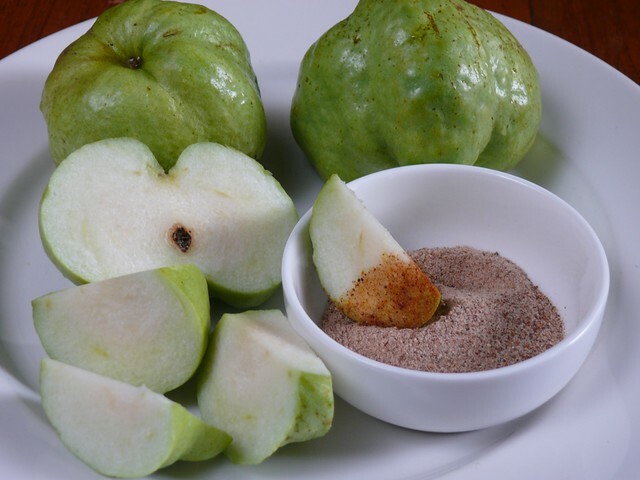 Seedless guavas eaten with a salted plum powder dip. Guavas are eaten like apples but the ones we get are so big that they have to be sliced up. Most people eat guavas with a salted plum powder dip but I think that's unnecessary salt and sugar. I wish I have an ice cream machine because they make much better sherbet and sorbet than the ones I made, which were done with a hand blender. Try making some soon. 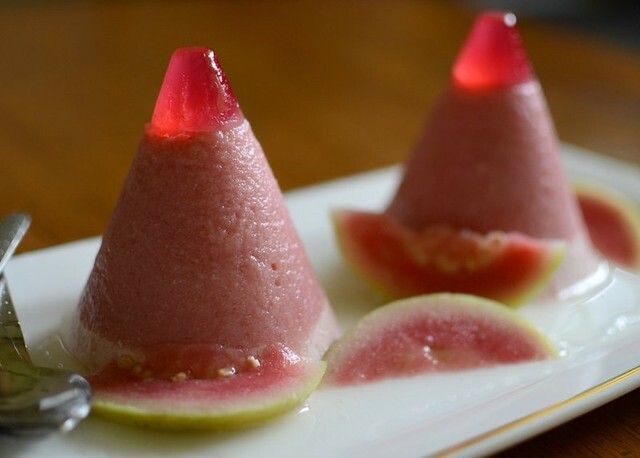 You'll be surprised at how refreshing and delicious pink guava sherbets and sorbets are! This is my first entry for the Pink Ribbon fund raiser for breast cancer awareness and support. Celebrate our boobies, ladies! (men too). 1. Put the water into a small metal pot, sprinkle gelatine powder over and let it soften for 2 minutes. Add the sugar and cook over a gentle flame, stirring until the gelatine and sugar are dissolved. Using a toothpick, stir in a wee bit of pink coloring. Cool. Divide into two Rick Munro moulds and put into the fridge to set. 2. Blend the guava with the 1/2 cup of water into a fine mush. Sieve to remove the seeds. You should get about 500 ml of pulp. Reserve 1/2 cup for the sorbet. 3. Put the gelatine powder into a small metal pot, sprinkle the gelatine powder over and wait 2 minutes. Add the sugar and cook, stirring over a low flame, to dissolve the gelatine and the sugar. Cool. 4. Mix the gelatine mixture with the guava pulp (about 1 1/2 cups), pour into a shallow metal pan and freeze two to three hours until firm and hard at the edges. 5. Scrape the guava pulp into a deep mixer bowl and use a hand blender to turn the pulp into a thickened slush. Divide the guava slush between the moulds, leaving about 1.5 cm for the sorbet. If there's leftover guava slush, add that to the reserved guava. 6. Put the gelatine powder into a small metal pot, sprinkle the gelatine powder over and wait 2 minutes. Add the sugar and cook, stirring over a low flame, to dissolve the gelatine and the sugar. Cool. 7. Mix the gelatine mixture, milk and cream together, pour into a shallow metal plate and freeze for 3 hours. 8. Blend the sorbet until light and creamy and divide into the moulds. Freeze for at least 8 hours before serving. Decorate with cut slices of pink guava. notes: if you have an ice-cream maker, use that instead of the hand blender. The result will be very ice cream-like sherbets and sorbets. Gelatine powder make softer sherbets & sorbets but I prefer the guava sorbet/sherbet without gelatine. Wow! What a delicious idea and 'on theme' shaped desserts! I found unmoulding frozen treats a little tricky but I'm definitely going to include them in some of my posts! Looking forward to the recipe! Great idea Terri. I am having the same problem unmolding the jellies. You should see how many I destroyed. I find it easier if you soak them in hot water for a few seconds and it will be easier to take them out. Very intresting & very creative. Really pretty and love the pink guava! I haven't tried on jelly, fingers crossed would be ok! Some ideal for your & I'm not sure if this will help. 3. Mt Fuji shape (pour some condense milk on top before taking picture). Look like snow. so proud of you! These look GORGEOUS, wish I could try them now. Can't wait to help you out when I get back! You're really clever!! I like your Sorbet a lot!! ...I've got a Guava plant growing in my house in Italy!! Hope it will fruit one day!! ...I'm here in Bristol, a bit tired, but really positive! Hope to find something soon! babe: oh, sweet babe, thank you! malaymui: thnks el. any suggestions pls? zurin: you(don't)know how i appreciate ur encouragemt! icook: me too! am sick of jellies now and there's 29 days to go?! oh when i dip the cones in hot water, the jellies melt quickly. wil use gelatine instead. yi: thank God u r coming home!! i need ur help!!! Great creation. Those sherbet sorbet will do me good in this weather. Love sorbet, and i liked how u have the jelly on top of the sorbet and still hold together perfectly! Well done! It is so beautiful sorbet especially with the pink guava. I am going to try it right way. Looking forward to your next creation. Lots of work involved here and like Billy said..they're so perfect. Well done. WoW! I stare in awe! They look so pretty! Great idea! Your Pink Guava Sherbet Sorbet looks so refreshing and delicious. Would love to try this at home with Ker Soon. He is into baking and cooking lately and he will love tho try this one out with me this weekend. We are proud of you. All the best in the rest of the contest =) Wish to visit you and the family again soon. Put the gelatine powder into a small metal pot = did you mean out the water?